The Facebook messaging system has several nifty features that will make it easier for you to communicate with your audience and save you some time as well. Please open up your page messages inbox on a computer and read on to see how each feature can help you organize and manage your messages more effectively. This is a quick way to separate your most important messages from the rest. Flagging a message will put a red mark next to it. Use the wheel next to each important message to flag it, and then you can click Flagged at the top of your inbox to sort out all the other messages. This way, you are able to focus on the ones that you most urgently need to respond to, and then return to the others later. We also have the sender’s profile information placed right next to their message thread. This way, you can easily check for any information that will help you customize your conversation in a way that is most meaningful to them. Use this feature to add words that you can identify each message by. It could be the topic of conversation, their needs, your next action point, or whatever makes sense to you in the current situation. This is a convenient way to summarize the conversation so that you don’t have to read through the thread all over again when you go in to respond. If there is a question that you receive often, you can craft a detailed response to it and save it so that you don’t have to write the same message over and over again. This is a great way to let your clients know that you are not currently available to respond to their requests, and when they can expect to hear from you. There’s a “Message” option next to each comment on your page content that you can use to respond to your readers in private, for instance when the discussion involves sensitive personal information. 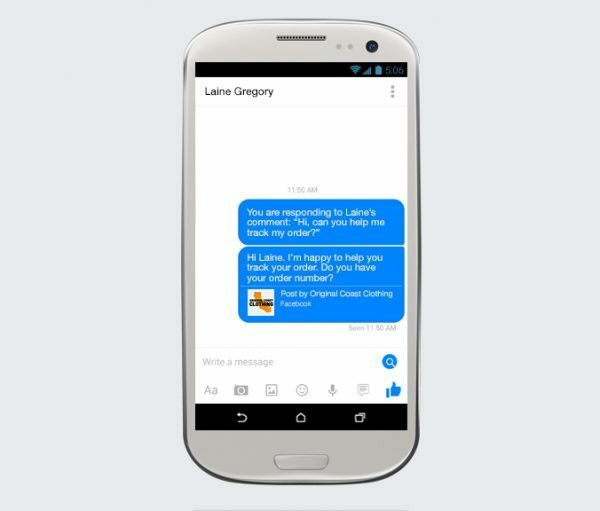 This option enables you to automatically respond to any message sent to your page via a previously crafted message. You can use this tool to let your customers know when to expect a personal reply from you. Note: Instant Replies aren’t sent when your Page’s messaging status is set to Away and aren’t included in your Page’s response rate or response time. The response rate refers to the number of messages you’ve responded to in relation to the total number of messages you’ve received, and the response time simply means how long you take before responding to a new message, on average.